We are being asked if the Fabrica REEF is available to dive. This is not one of the two Ex-war ships that we are planning but the first of hopefully many contributions within the Community area of the Wreck to Reef project. It can be dived but we would ask that the 5 cameras that are sending live feeds to the internet, are given a wide berth and left to do their thing so non-divers can see the marine life grow. The co-ordinates are Lat 50 36’58N Long 002 20’ 51W. Depth is 21.6 mtrs to the sea bed and 17.2 mtrs to the top of the wheel house. It is a mile and a half off Ringstead beach about 3 miles from Weymouth. Its 45 feet long so not the biggest but perfect for its purpose. There is a large yellow buoy attached to it with solar panels to drive the cameras and Wi-Fi links, so finding it should not be a problem. The cameras alternate being on every 5 seconds so someone may see you at some point. We are in the process of undertaking some housekeeping regarding the cable routing so may well be diving the site over the next few weeks. The webcams are at . But Fabrica are having some issues with them at the moment. Yes we are happy for anglers to access the site. 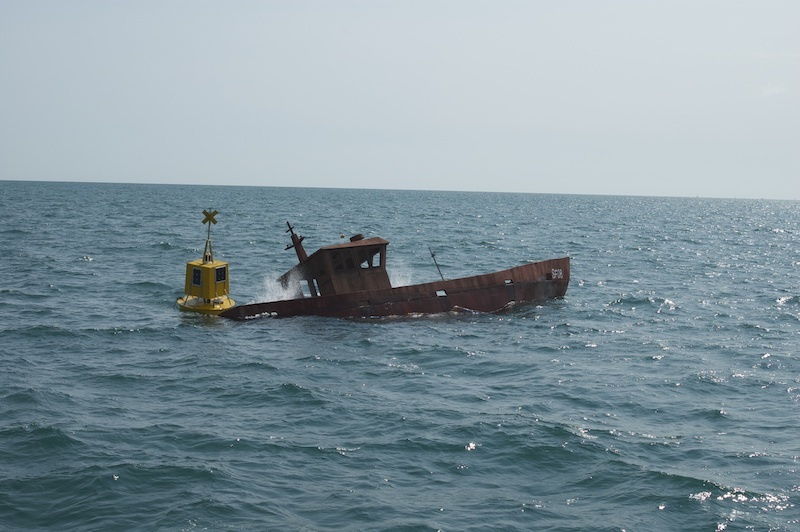 Please be very aware that there may also be divers on the site too, and under no circumstances moor on the communications (big yellow) buoy as it contains sensitive equipment. Hi, I’m interested to know how the webcams are performing? I’m the sole UK distributor for View into The Blue who have developed a proprietary self cleaning webcam that can stream HD video to any web enabled device. Further details can be found on the website. Underwater webcams is what we specialise in. Do you need any permission to dive the Fabrica? What is the best time (slack) to dive her? No you do not need permission to dive the Briony Victoria. She lies at about 22m.